PHOTOS: Above – Ormiston Pound in the West MacDonnell Ranges. At left – Alice locals have always insisted on a high level of comfort in their bush camps … but hot shower? Doesn’t get any better! Sir – There will be architecturally-designed semi-permanent campsites on the remote Larapinta Trail. 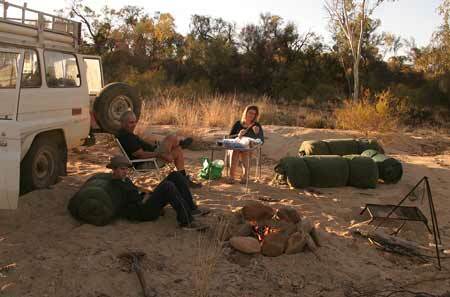 The camps, which are the brainchild of tour company, World Expeditions, provide an oasis in the desert for trekkers – hot showers, quality food and a place to rest after exploring the spectacular red centre. The Larapinta Trail is one of the Australia’s most spectacular attractions and these camps will make the trek even better for tourists to the Territory. The design is a world first, in terms of its capacity to cope with extremes in temperatures and, practically, as it will deliver a level of comfort previously unavailable in remote desert regions. This new level of comfort makes the Larapinta Trail more accessible to a much wider section of travellers, which is exciting for attracting more people to this beautiful part of the world. The Larapinta Trail was recently named as one of only seven iconic Great Walks of Australia and these new camps will help attract more visitors to the Territory, particularly from Europe where adventure trekking is extremely popular. The new campsites were developed to ensure the impact on the land by trekking groups is minimised, while at the same time engaging the traditional owners as partners and lifting the Larapinta Trail to Great Walks of Australia status. The Territory Government has provided significant support to the initiative, with the Parks and Wildlife Commission NT managing the process and crafting strong guidelines for the campsite development to ensure the West MacDonnell National Park is protected. The Government, the Central Land Council and the traditional owners have worked together to allow joint management of the National Park and the exclusive sub-leases that allowed the infrastructure to be built. World Expeditions General Manager Domestic, Chris Buykx, said the project began in 2005 and ever since each of the stakeholders has demonstrated a continuous commitment to seeing the project to fruition. “The project couldn’t have happened anywhere but in the Territory,” Mr Buykx said. The 150sqm campsites incorporate technologies including water-free composting toilets, solar lighting systems, a hybrid grey water disposal system and the structure can be removed to allow the land to recover in the off-season. World Expeditions says the Larapinta Trail has been its top selling itinerary worldwide for a decade, outselling other big-name treks such as the Inca Trail in Peru, Everest Base Camp in Nepal, Kilimanjaro in Tanzania and Kokoda in PNG. The Larapinta Trail extends over 223 kilometres along the backbone of the West MacDonnell Ranges. This exciting long distance walking track is divided into 12 sections, each a 1 to 2 day walk. The Trail encompasses some of the key attractions of the Ranges including Simpsons Gap, Ellery Creek Big Hole, Ormiston Gorge and Glen Helen. Quality food in Alice Springs … has Sydney or Melbourne relocated?